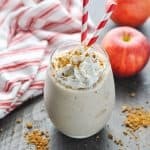 Full of protein and fresh fruit, this Apple Pie Smoothie is an easy and healthy breakfast or snack that's ready in just 5 minutes! Combine all ingredients except toppings in a blender and mix until smooth, thick, and creamy. Garnish with whipped cream and cookie crumbs crumbs and serve immediately! For purposes of calculating nutrition information, I used 1 scoop of Quest Vanilla Milkshake protein powder (100 calories per scoop). You can substitute with any protein powder that you prefer, or use vanilla Greek yogurt instead. Don't forget to freeze your diced apple in advance! The frozen fruit thickens the smoothie without watering it down. For a protein smoothie that's thick enough to eat with a spoon (my favorite! ), use at least 2 cups of ice and just a small amount of milk to get it to blend together. If you want some extra fat for staying power in your smoothie, add a tablespoon or two of almond butter or peanut butter to the mix! Use a plant-based protein powder for a vegan apple pie smoothie recipe. If you don't want to use protein powder, you can substitute with a container of vanilla Greek yogurt or non-dairy yogurt. The calories and nutrition information will change, though. Add a dash of caramel flavor for a Caramel Apple Pie Smoothie! If you don't have apple pie spice you can substitute with 1/2 teaspoon of cinnamon and 1/4 teaspoon nutmeg. I used unsweetened vanilla almond milk, but you can substitute with any milk that you prefer. Did you know that you can now buy non-dairy versions of Reddi-Whip in a can? Now your vegan protein shake can include whipped "cream" too! I've seen both almond milk and coconut milk versions of Reddi-Whip at my local grocery store, so keep your eye out for those. Garnish your smoothie with any sweet, crunchy topping that you love. I think a small crushed gingersnap cookie is perfect, but you can also use granola or graham cracker crumbs!